Still Alive, Still Not Writing, But Getting Closer! Looks like it's time for my monthly check in! I still haven't been completely cleared by my team of doctors to resume normal activity, but I'm feeling hopeful about my appointments next week. Mostly, I just want the damn PICC line out of my arm and to stop the IV antibiotics, because that's all annoying and the meds make me tired. As the title of this post indicates, I haven't *quite* resumed writing yet. But! Though I didn't know if my brain was up to writing, I figured I might as well give editing a try, thinking that would be a little less mentally taxing. I've been going back through the old files to see if anything is worth rescuing and resubmitting. I don't know if anything will pan out from this, but at least I'm doing something. I finally finished the scarf/shawl/wrap thingy I mentioned in my last post. 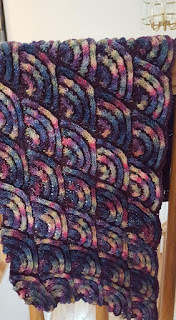 It needs a light blocking, but I took pictures anyway. The pattern is supposed to resemble dragon scales, and we all know how much I love dragons. I also played a new video game; while nothing I've read recently comes with a strong recommendation, I can wholeheartedly recommend Life is Strange. Even if you're just a casual gamer, the story and characters are fantastic. I don't think I've been as emotionally affected by a game since Mass Effect 3. Plus, due to the structure of the game, there's plenty of replay value. The main game has a prequel with the same characters, which I played and liked well enough, though it didn't have quite the same charm as the original, and then a sequel with a whole new cast and setting, which I haven't started yet. If you're looking to participate in an interactive story, definitely check it out! When last we left off, I'd been sick for a month and hadn't been doing much of anything. Long story short, I wound up having major surgery for my chronic illness in mid-January. Major as in, "we'll try to do it laparoscopically, but we might have to cut you open," and sure enough, I woke up with a large incision and a temporary drain. At least I'll look like a badass on the beach this summer with my new scars. Recovery mostly went well, though I had a few false alarms in the past week or two, but I seem to be headed in the right direction now. I haven't written anything yet, but I've at least started thinking about it again! While I was following doctors' orders and sitting at home, resting, I did finally do some reading, which I rarely have time for. As I read some books that have been on my list for a long time, I realized my reading preferences have aligned with the way I write. I discovered that for me, it doesn't matter how beautiful and deeply descriptive the prose is, I prefer a plot that moves along at a quick pace. My reading list does contain a lot of mystery and suspense, and I was trying to branch out, but I guess there's a reason I lean toward those genres. 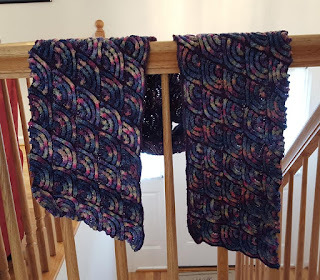 Other than that, I've just been loafing around on the internet, going to doctors appointments, and working on the neverending scarf/shawl/wrap thingy that Ravelry tells me I started back in August. (Oof.) I've been gradually getting out more, though I miss doing fun things with the kids, going to the gym, and drinking wine. Writing will come soon, I promise!